The government of Canada’s western-most province, British Columbia, is currently considering whether to purchase a partially-developed private island after a First Nation community – the Cowichan Tribes – opened a civil suit asserting an aboriginal title on Grace Islet, a small, rocky island located off Saltspring Island in Ganges Harbour. The Minister of Forests, Lands and Natural Resources, Steve Thomson, confirmed earlier this week that he is currently seeking Treasury Board approval to give the province the option to purchase the island, which the Cowichan Tribes argue should never have been granted a fee simple title at the turn of the 20th century. 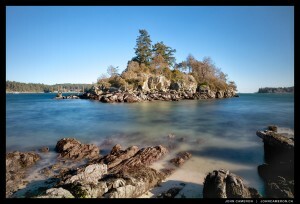 Despite being registered as an archaeological site as far back as 1966, Grace Islet was zoned as residential land and sold to its current owner, Edmonton resident Barry Skawsky in 1990 – an decision which “adversely interfered and interferes with the exercise of Cowichan aboriginal title to Grace Islet,” according to a spokesperson for the First Nation tribe. Matters were complicated further, when – despite the results of an independent architectural impact assessment confirming there to be both human skeletal remains and as many as 15 ancient burial cairns on the island – the Crown granted Mr. Skawsky permission to construct a sprawling retirement cottage upon the islet’s contested grounds – directly on top of two of the historical cairns. One possible solution the province is currently investigating, involves purchasing the land back from Mr. Slawsky with the help of other partners such as the Capital Regional District (who voted against expropriating the land earlier this year) and The Land Conservancy, a non-profit, charitable land trust which operates throughout British Columbia. “It’s potentially one of the options,” confirmed Minister Thomson. Given that aboriginal land claims are usually limited to Crown land, the case of Grace Island could potentially have significant implications for other B.C. landowners, as Alexander explains. “If these issues relate to this little piece of land, they would apply to dozens of sites just in the Gulf Islands. It could create a firestorm around commercial investment,” he added. “What would motivate a company like Petronas to spend billions of dollars on land if it could ultimately find a claim advanced against it?” Private Island News will monitor the situation with interest.